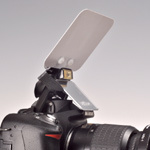 Pop-up Use - Demb Flash Products - Diffuser, Flip-it! 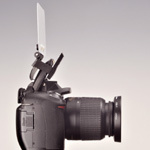 The pop-up flash on your camera has limited power and delivers minimal quality. 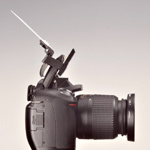 Because the lighting it produces is so flat and unattractive, many DSLR owners never even use it at all. The good news is that recent improvements in high iso performance, plus the use of camera and flash compensation settings make my flash modifier work, and with very attractive results. My favorite combo is: M mode, iso 650, exposure compensation of +1.7, flash compensation of +.7. In M mode you may choose a shutter speed which is high enough to counter a high percentage of window blow out when doing indoor shots in daylight hours and a good percentage of tungsten redness in indoor situations with lots of ambient tungsten. By using different angles on the rear reflector, I have been able to get results which rival those from Flip-it! 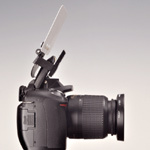 on external flashes, in both ceiling environments, and environments with no ceiling. Of course the range is shorter, the iso a little higher, and I am adding camera and flash comps. This is not for zoom shots from 30 feet away. But in the normal distance range for home family and party candids, 14 feet and closer, just pick up your camera, turn it on, and shoot. Beautiful! If you are comfortable using a higher iso, such as 1600, an exposure comp of 2.3 and a flash comp of +1 (or higher if you have it), you may extend the range even further. I do not suggest that the Pop-up Flip-it! is a substitute for your powerful external flash or that it is for professional assignments. 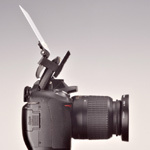 However, I believe that even you pros will really love it as an “off-duty” flash system for your personal photography. Reflector “off”, ceiling bounce only. Skim position provides delicate fill of ceiling bounce. Ceiling plus rear reflector bounce, or medium range with no ceiling. Reflector only, for furthest part of range. Direct flash, if you need it.